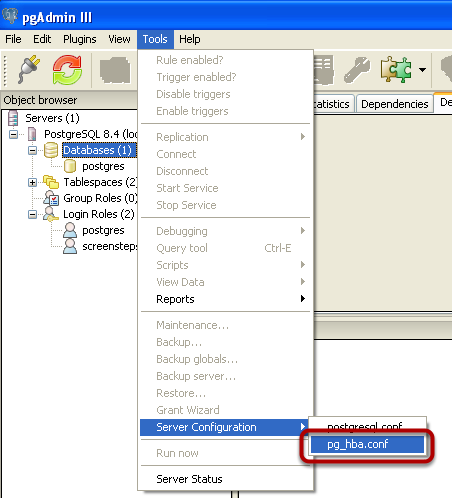 In order for computers to connect to PostgreSQL server on the computer you installed it on you need to configure PostgreSQL to allow it. Edit the pg_hba.conf file by selecting it from the Tools > Server Configuration menu item. To add a new entry, double-click on the last line where a checkbox appears but there is no text. The configuration dialog will appear. Your entry should match the one shown exactly except for the IP Address field. 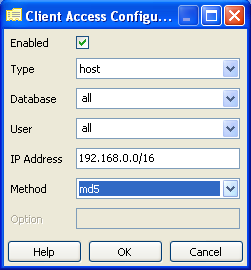 The IP Address field specifies which IP addresses can connect to the PostgreSQL server. You enter an IP address followed by a "/" followed by a number representing how much of the IP address of the computer trying to connect to the database server must match the IP address you entered. In the example 192.168.0.0/16 any computer that has an IP address starting with 192.168 will be allowed to connect. In the example 10.0.0.0/8 any computer with an IP address starting with 10. will be allowed to connect. If you entered 192.168.1.0/24 then any computer with an IP address starting with 192.168.1 would be allowed to connect. For more information click on the Help button in the dialog. When you have finished configuring the settings click OK.
1) Click on the Save button to save the file. 2) Reload the configuration settings by clicking on the green play button. What shall we enter to allow Screensteps users from outside the local network network to connect?